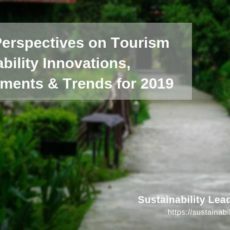 Which innovations, developments or trends do you think will be the most likely to influence the work of tourism sustainability professionals this year, especially linked to destination development and -management? This was our question to the destination sustainability panel which we convene in partnership with The Place Brand Observer (TPBO) a couple of times per year. Here the answers (in alphabetical order, with links to the respective interviews). In 2019 I don’t expect really new trends apart from a further spreading of overtourism from the current 50 cities to maybe 100. This will impact the holiday experience of 99% of international tourists, so this will become a major concern for many city tourism managers. In more and more cities it may become too late to secure authenticity of the holiday experience. If you know Venice, Barcelona, and Amsterdam from 30-40 years ago, you’ll understand why this can be an irreparable loss. Another concern for city managers in many cities! A no-deal Brexit economic meltdown in the UK will probably keep many Britons within the country and will make the UK an attractive (cheap) country for Europeans (who will also be hit by Brexit), Americans, and Chinese suffering a recession due to a US-China trade war. So as soon as the Brexit chaos at UK ports and airports is solved, I expect the UK will be hit by some serious overtourism. To their surprise, the British will see a lot more foreigners than ever before, thanks to Brexit! I can see the positive worldwide revolution of raising women’ rights voices, like #metoo and other social media campaigns, as a force to influence more professionals to address gender balance at a destination management level. Especially in India, where tourism is predominantly a male-dominated industry. We have seen this enormous influence as a force for change. This year, we have won two of the most prestigious world awards; the TODO Award at ITB Berlin, and the India Responsible Tourism Award by WTM, for our Women in Tourism initiative. As well, we have faced a greater interest from big tourism companies to implement more experiences lead by women. Some innovations to be implemented are, for example, in the transport or guide services within India. 99,9% of commercial drivers and 95% of guides are male. Sakha Consulting, for example, is a social enterprise focused to train marginalized women to become taxi drivers. Open Eyes uses female taxi drivers for 90% of the services we need in Delhi. And we have our trained female guides in our Spice Girl Tour in Delhi. – I’ll preface my statements with the recognition that working as a public servant and leading a national tourism board affords a perspective that isn’t accessible to many tourism sustainability professionals. This lack of insight leads to an issue where all the best intentions in the form of recommendations, master plans, etc. oftentimes aren’t practical, let alone grounded in the realities governments face. – Issues revolving around overtourism and under tourism are not new developments or trends. They’re formidable challenges that take lots of time, patience, perseverance, and most importantly, political will to address. – In destinations where tourism is an emerging sector, addressing formidable challenges linked to infrastructure, access, and the expense of travel are usually not the responsibility of the national tourism board who can advocate for better circumstances but ultimately doesn’t have control of these matters. – Practitioners know inter-ministerial collaboration is key to implementing sustainable development and management practices. Improving the policy environment doesn’t happen overnight though. Oftentimes it’s tied to annual budget cycles and of course political agendas. If the stars are aligned, things can improve rapidly, but this is not the norm. Adopting a Green State Development Strategy at a national level linked to the SDG’s and fostering alignment between and across governmental ministries and agencies in resource allocation, planning, and implementation. The fact that an increasing number of travelers are actively seeking out authentic nature, cultural, and adventure experiences in unspoiled destinations. We saw an increase of nearly 16% in visitation in 2018 tied to targeting this market and a dual focus on increasing the volume of travelers and the value each individual traveler represents. Community-led and owned tourism in Indigenous communities. This is an evolution of the traditional community-based tourism approach where the community governs, owns, and manages the tourism enterprise and equitably distributes the benefits to the entire community. The SA and E of SAVE travel. Leading universities and research organizations have had a long term presence in Guyana. We’re now actively focused on further developing the scientific, academic, and educational markets. I see three key trends that are impacting and influencing destination management and development and thereby resulting in innovative approaches. The first is the slowly growing awareness by the consumer of the negative impact tourism can have on a destination, and as a consequence voting with its feet. This will force destinations to consider carefully their tourism management policies and as I’ve indicated before, move from a purely tourism marketing focus to longer term tourism management strategies. Blu Planet has awakened consumer’s sense of responsibility in relation to plastics and the hope is that this will only grow and help drive behavioural change across a range of environmental issues. Air Pollution is another issue I predict will grow in significance over the next few years. What if consumers could see in advance of booking a holiday what the quality of air was like in a chosen city or destination? Would this influence buying decisions? I think so, and as a consequence this will force local government to think more about the air quality, environmental management, and transportation systems. The second is the impact this will have on local management. The increased role on Mayors and local councils to address tourism policies, and driving local institutional decision making and management. The third is the role of technology and how it can assist in delivering effective tourism management solutions. Technology is a tool to be used and isn’t the answer in itself. However, we are already seeing the effective use of mobile data to influence visitor flows in some destinations. The opportunity to monitor in real time can ultimately assist capacity management, and with open access to data this could help plan visitor flows and improve supply chain management. What is encouraging is that people are beginning to see sustainable management, whatever the problems or solutions, as a core agenda item and not something that can be ignored or pushed aside any longer. As always, sustainability professionals will have to contend with both forces for good and as well forces of evil. One trend that highlights this dichotomy is the widespread media coverage and popular adoption of the label overtourism. On the one hand it highlights the impacts on destinations of poor tourism planning and regulation, and the inevitable consequences of an unquestioning growth model in tourism. This means that many more destinations and government agencies are now giving tourism sustainability issues much greater attention. On the other hand, the almost panic like rush of tourism academics to get famous for this media phrased term has meant that the focus of research and policy so far has been on tourist crowding, which is rarely the real problem for residents. Much of the academic research discussion to date seems to be driven by a concern for the visitor experience and not destination community well-being. Overtourism just means unsustainable tourism where the negative impacts for the destination environment and community outweigh any positive impacts. The answer lies, as it always has, in detailed and critical analysis of all tourism impacts – not just crowding. The continued trend of massive growth in international tourism out of Asia, the growth of cheap large scales cruises, and the general increase in budget travel options continues to pose some serious sustainability challenges for many destinations. It is not the crowding that’s the issue in many destinations, it is the waste generation and resource usage of massive increases in visitors. But it is not all bad. The rise and success of the explicit use of stories in destination marketing has led to more and more explicit use of stories in the design of tourism experiences. Many of these are still too focused on telling stories to tourists, rather than on helping tourists to create their own stories, but that change is happening. The rise of stories gives tourist sustainability professionals the opportunity to use tourism to tell stories of sustainability. There are two ways this story trend can be used for sustainability. The first is to use the opportunity of rewarding tourist experiences to tell visitors a sustainability story. A rewarding tourist experience helps make a receptive audience more likely to listen and feel good about a sustainability message. This is the opportunity to tell stories about how the destination is contributing to sustainability. The second way to embed sustainability in tourist stories is to help visitors create their own sustainability stories. Working with experience designers, destination managers can create experience opportunities where the tourist becomes the creator, producer, and teller of their own personal sustainability story. At the destination level, the main challenge is to embed more sustainability stories into destination marketing and experience development. At a broader level we really need to start addressing the idea of traveling less (in terms of both distance and frequency) and staying closer to home. The insistent pressure of growing overtourism will likely prompt more innovation in technological methods for tracking and better distributing large numbers of tourists. We can hope it will also prompt better, more holistic methods of destination management and a decline in the simplistic “more is better” approach, which is still espoused by far too many governments and tourist authorities. One positive trend may be more and better attention to under-touristed areas, but without good stewardship they may eventually fall prey to the same fate. Consider the changing histories of: Italy’s Cinque Terre, El Nido in the Philippines, and Ireland’s Wild Atlantic Way. For the foreseeable future, the number of places that can be called undiscovered or unspoiled will continue to shrink. Without better care for these destinations, so will the interval between “under-touristed” and “over-touristed”. 1 Circular economy: I expect we’ll see considerable discussion around how businesses and destinations can apply circular economy principles to sustainable tourism. Like so many things in the tourism system, applying these principles will be a complex problem – but one that is critical. 2 Regenerative Tourism: Ties to the principles of the circular economy, but worth watching as a separate trend by itself is regenerative tourism. Regenerative tourism is a more hopeful paradigm than sustainability in some ways. It says – we can use tourism to make the world better – not just to minimize the negatives. Again, as positive as it is, there is much work to be done and it needs to build on the foundation of sustainable tourism management. 3 Increased focus on climate change. Here in the US we’ve seen an awakening on the urgency of climate change. That will continue and hopefully grow. 4 Consumer engagement in sustainable tourism. The vast majority of discussions on sustainability have been supply-side driven. There is growing body of work on the consumer side of things. From new insights on market dynamics, applications of behavioral science and behavioral economics etc, we are gaining a far better understanding of travelers, their role in the sustainability of the tourism system, and how we can encourage pro-sustainability actions. I’ll be looking for innovations in this space – like the Palau Pledge etc. Innovations, developments, and trends I believe will have influence on sustainability professionals this year and in the future are summarized below and excerpted from Ecotourism Outlook 2018, prepared for the 2018 Outlook Marketing Forum, USA. Travelers exhibit increasing concern regarding environmental and cultural impacts, and are more likely to choose low-impact, sustainable travel options. Tourism managers are faced with the expectation to accommodate this shift by making sustainable purchasing decisions, pursuing sustainability certifications, and providing opportunities for travelers to give back to local communities. This is reflected in a rise in the number of consumers, from 65% in 2017 to 68% in 2018 actively seeking out eco-friendly accommodations. Accordingly, the practice of allocating specific budgets for Hotel Green Teams continues to expand, and visitors can expect to see more Green Teams in place at both full service and limited service hotels. Businesses in the lodging sector lead the curve in implantation of energy management systems that result in high impact cost savings through conservation. According to the Green Lodging Trends Report 2017, hoteliers are meeting consumer demand for energy efficiency through the implementation of energy saving systems such as of LED lighting, high efficiency boilers and chillers, on-site renewable energy systems, green roofs, and Electric Vehicle charging stations. Demand for authentic, experiential, and transformative travel experiences is on the rise. Travelers are now more likely to seek out experiences that include cultural immersion and experiential education and have the potential to be eye opening or life changing. This trend is also recognized by the Adventure Travel and Trade Association’s latest report, which concluded that adventure travelers desire to explore the backstage of tourism areas, seeking out destinations that will allow them to feel like temporary locals through genuine amicable interactions between locals and visitors. Visitor demand for health and wellness travel experiences that enrich both mind and body continue to grow. However, travelers are less likely to base their primary motivations for travel in health and wellness, but rather expect a wide availability of physically active and mentally restorative secondary activities during travel. Additionally, companies are responding to demands for wellness elements within travel through innovative programs designed to limit traveler stress and maximize health and wellness outcomes during travel. Global economic developments have supported the growth of a freelance and entrepreneurial traveler with a preference for co-living and sharing economy-based tourism experiences such as Airbnb. However, a recent report from Allianz Global Assistance reported the first decline in traveler intention to seek out sharing economy services during summer 2018. Allianz reports that Millennials continue to drive demand for sharing economy experiences during travel, yet cite concerns regarding ease of booking process, reliability, and corporate culture as factors impacting decision making. Recognizing changes in the natural world caused in part or entirely due to human actions – such as climate change, pollution, and habitat loss – tourists are pursuing what is referred to “last chance” tourism. Last chance tourism is travel motivated by the desire to see threatened or diminishing natural attractions, including glaciers, coral reefs, endangered species, etc. Locations featuring these attractions may continue to experience heightened visitation, simultaneously creating opportunities for increased awareness and resource protection as well as increased risk of overtourism. The Global Sustainable Tourism Council (GSTC) acknowledges overtourism as a major threat to the industry. Overtourism describes the tipping point where the costs of tourism outweigh the benefits for local communities due to overcrowding or poor management. If not managed properly, overtourism is a threat to sustainable tourism development. The growing concern for overtourism offer opportunities for tourism professionals to implement sustainability best practices and improve site-specific sustainable destination-level management plans. CREST cites overtourism as a complex trend in the travel industry and calls upon destination managers to engage with all sectors and stakeholders involved in tourism towards long-term, fact-based planning to mitigate overtourism. Global threats to political stability, civil liberties, and human rights challenge safety and security integral to the travel and tourism industry. Travelers are also increasingly aware of human rights and working conditions, demanding forms of responsible tourism that protect people and give back to communities. 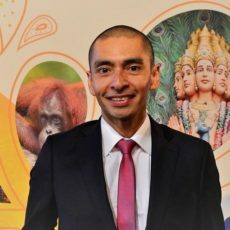 Sustainable Tourism planners are faced with a unique set of challenges and opportunities in navigating strategies to address to both the needs of travelers and hosts with regard to human rights and social justice. Inclusive tourism is a growing sector within the industry that emphasizes the idea that tourism is for all and that operators should actively strive to improve accessibility for all persons. While certification, guidelines, and best practices remain important to guide ecotourism lodging and operators, there is an increase in considering the destination as a whole. 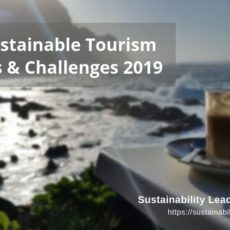 This trend is developing and endorsed by the Global Sustainable Tourism Council in implementing sustainable tourism, inclusive of all forms of tourism. According to the GSTC (2018) “public sector tourism policy-makers and destination managers throughout the world turn to the GSTC Destination Criteria for guidance in developing policy, raising awareness and conducting training, and for use as a framework for national or localized sustainability standards. GSTC urges policy-makers and destination managers to pledge to adhere to the GSTC Destination Criteria.” Certification bodies are now certifying destinations. Destinations are inclusive of all types of boundaries, such as parks, islands, towns, and cities. With the advent of destination criteria more entities are taking a holistic view of sustainability and turning to the socio-ecological system as a means for effecting positive change in tourism. 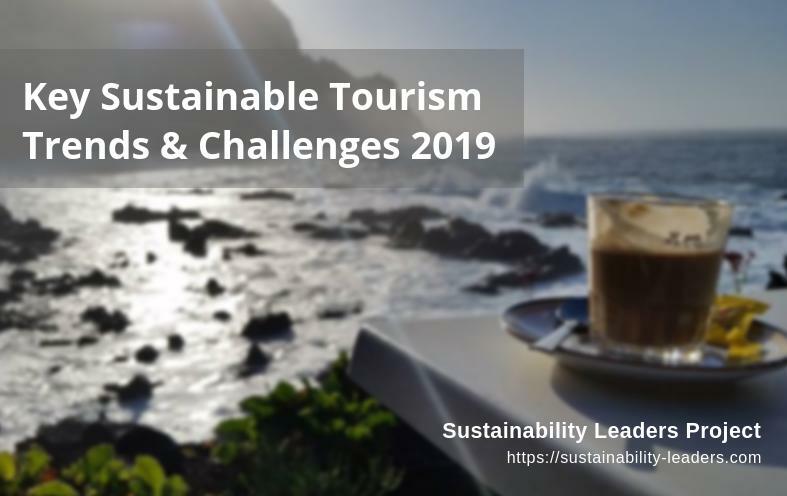 The International Year of Sustainable Tourism was an opportunity to educate people all over the world, from businesses to consumers to multi-national organizations to celebrate, explore, and connect to benefits associated with sustainable tourism and especially ecotourism. Building on the Millennium Development Goals, the 17 Sustainable Development Goals (SDGs) with 169 associated targets. The purpose of the SDGs is to end poverty and hunger, improve health and education, make cities more sustainable, combat climate change, protect the world and oceans from environmental degradation and foster prosperous, peaceful, just and inclusive societies. Tourism, specifically mentioned in three SDGs as explained by Earth Changers (#8, #12, #14), has significant potential to contribute, directly or indirectly, to all SDGs, in more ways than most industries. To assist in engaging citizenry and all tourism stakeholders around the world in the SDGS, UNWTO developed the ‘Tourism for SDGs platform‘. The platform’s three main features, Learn, Share and Act, are also calls for action, conversation and collaboration towards a sustainable tourism sector. After a year focused on plastic, I think sustainable food with respect to climate change and wellness will be the most influential this year, particularly around creating great vegetarian options and alternative proteins. FIRSTLY, a great deal of effort will be invested in managing tourist flows in time and space. Increasingly destinations are facing overload at a certain time of the year. For managing tourists flows, we will have to put more effort in directing tourists when to travel, create new itineraries, find new attractions, and create new experiences. New technologies and better management of big data resources can be of extreme help here. The Slovenian Tourist Board is working with DMOs to move from destination marketing to destination management, in order to support this transformation and re-focus. This is enabled through clear tourism policy, increasing synergies between national and destination marketing activities, and through active coordination of Slovenia’s 4 regions and identified 35 key destinations. SECONDLY, sustainability has gained new dimensions. The ultimate goal of a destination should be a destination as a better place to visit and a better place to live in. Today, tourists not only want to act responsibly, but also to learn from a destination. In Slovenia, we have been tackling sustainability issues systematically and strategically for the last 10 years. We have provided concrete solutions and measures through our Green Scheme of Slovenian Tourism, which helps us to embrace and unify all efforts of sustainability practice in a country and to live up to the promise of our destination brand, whose essence is our love for nature. Through this national model we have now established very solid grounds for sustainability management practices, both for the destination and tourism providers and businesses. In our current tourism strategy we defined the vision of Slovenia as a green boutique destination for 5-star experiences. THIRDLY, “local” is the key word for 2019. The trend is to give tourists the opportunity to live like a local when visiting a destination. Authenticity and more interaction with local population improves contentment on both sides. Tourism is becoming a tripartite activity between providers, tourists, and locals. For a destination, it is important to live the brand, to run the values of the brand through every act of product creation or communication, by all people in the destination. AND FINALLY, YET IMPORTANTLY, we need to understand and pay attention that in today’s travel market, there is a greater demand for unique, sharable, and increasingly personal and individualized experiences. The consumer has taken control. They create content, they are the influencers and they have re-defined core ideas like the meaning of “luxury”. Unique trips designed by the traveller are the new norm. Slovenia is taking advantage of all of its natural and cultural assets to cater to self-indulgent visitors, allowing them to focus and explore the destination based on their specific desires and preferences. In this regard, we are giving our visitors the tools to curate their travel experiences according to their interests, available time, and individual budgets. That is why we will be launching a new creative solution in March 2019. The new My way direction provides highly individualized consumers with a plethora of choices, freeing them up to their senses and inviting them to experience Slovenia in their own unique way. Recognizing the UN International Year for Indigenous Languages, developments with the indigenous people will have more weight on the destination development and management. Not only limited to their languages, but also linked to their peculiar culture and belief that shape the uniqueness of the destination will be sought for in tourism. A lot of times these people are blessed by living in natural areas. It is an extremely important matter to mutually respect and conduct tourism in a responsible manner. This January, the Asian Ecotourism Network has released a declaration on indigenous people. Governance I think that would be a main topic for tourism sustainability professionals, and also DMO’s and public entities; especially linked to destination development and management. Governance is a key for social innovation, for local empowerment and development. Who understand this, assure a successful destination management; taking into account different points of view and implement local ideas, this will support empowerment and assure a good implementation process of plans and actions in the destinations. by the end of 2019 I think Planet Happiness will be shaping and influencing the work and destination management conversations of tourism sustainability professionals around the world. Overtourism has fully come into its own, and is of course clearly linked to destination development and management. At the same time, there are an increasing number of emerging destinations which remain under-visited. I think we will see an increase in efforts to attract travelers away from the main destinations and towards secondary destinations. This is already a big push in Thailand at the moment, for example. One of the biggest ‘elephants in the room’ with destination planning and development, especially in developing country contexts, is how corruption undermines the best made plans. It would be great to see more action research on which specific stakeholder / participatory processes can make corruption more difficult. How can we harness the power of the travel industry in order to sustain local communities? Could “sustainable travel engagement” be part of the solution for overtourism? I believe that with the right digital platform which would combine sustainable gamification, community engagement and Corporate Social Responsibility Reporting, DMO’s and Tourism stakeholders could make a real difference in their own destination, while contributing to the Sustainable Development Goals of the United Nations. There is a growing awareness of sustainability due to the recent increased media about Overtourism. While this has also led to a negative backlash against tourism which in some cases is harmful to destinations, it has also increased awareness among diverse stakeholder groups about the need for more inclusive tourism decision making, planning and governance. There is also an increasing trend in tourism taxes (to some extent due to the over tourism issue) but more and more destinations are realizing that they can charge the tourist to fund sustainability projects. Additionally there is increasing innovation as to how destinations are educating responsibility of their guests. Tourism Iceland has led the way with humorous educational campaigns but New Zealand, Monterey, California, Palau, Amsterdam and others have also produced good awareness materials, videos, tourism pledges and the like. These and other innovations will move sustainability more into the mainstream and hopefully shift the conversations within industry from marketing to marketing and management. The arrival of the tours and activities online booking systems (like KimKim, TripAdvisor Experiences, AirBnB Experiences). This space is developing really fast and will create an opportunity for delivery, but will also muddle up the market. Working smartly in this space will be critical. The massive size of the Chinese outbound market, and a completely new “under“ understood market behavior that this brings will have a tremendous impact on destination development and management. Managers will scramble to understand this market, and also to try and stem the influence this has. The local pressures against over-tourism. Most sustainability professionals were already struggling to understand over-tourism and how to manage it. The local pressure against it is rising in bigger cities – where there is struggle with gentrification, garbage, commodification of culture, and all the negatives that over-tourism brings. Wading through this pressure and bringing about sustainable practices will be difficult. A global trend to shorter holidays, and the ever growing demand for experiential experiences will also influence the work in destinations, and preparing destinations for this demand, and developing the supply and capacity to handle this will be key! Better measurements of impacts to inform destination development. Example, CR is moving full speed measuring the social progress index in all tourism centres in the country. Food waste. Many companies are moving forward very proactively but the need to do something on the matter is greater every day. Local, sustainable procurement. Again, CR as an example will be taking a leading role with a new effort to secure markets for sustainable agriculture products in the tourism industry. Throughout 2019 we’ll see further examples of destinations following the likes of the Balearics, Iceland, New Zealand, Venice and, most recently, Edinburgh, by introducing tourism taxes. What will be important to understand is the extent to which these taxes support destination management. Some countries, such as Japan, the Balearics, Iceland and New Zealand, are ringfencing revenue for infrastructure projects intended to help protect the destination, and Bali has stated that its proposed tax will be used to tackle plastic pollution and other environmental and cultural projects. Elsewhere, Venice and Amsterdam have targeted day-trippers and cruise passengers to extract additional value from these market segments. In our report with Cornell University and EplerWood International (register here for your free copy), we show how tourism has failed to account for the full costs of tourism growth. There are many hidden costs, which we call the “Invisible Burden” of tourism and it is therefore understandable that destinations are now seeking to recoup those costs. Whilst an additional tax seems an attractive option, without actually measuring the Invisible Burden to understand its nature and scale; without knowing the cost of maintaining destination assets and identifying those at risk; and without properly reviewing current tax structures, any new fiscal policy may miss the mark. Destinations should hold back from rushing ahead with an isolated “quick fix”, when a more coordinated and data-driven set of responses is required. This is twofold for me. My work with destinations tends to often focus on product and experience development – but in recent projects we’ve focused more on how destination managers can encourage the development of products and experiences, rather than be directly involved with product development themselves. Instead they are creating experience streams, destination themes or tracks, and then curating existing products – this inherently leads to idea generation and opportunity. Personally, I prefer this approach because it improves the viability of the product or experiences. This encourages greater collaboration at the destination level, which is crucial to a region’s tourism sustainability. The other trend that I think more and more destinations are trying to come to grips with involves visitor flows – from where are they coming and when? I hope that technology and greater access to data can help destinations truly understand this. It’s certainly a stumbling block at the moment for many destinations, and specifically lower tiered destinations. It depends on the context of the destination – and that includes its current status as a developing or development destination, it’s people skills, the financial resources, the ease of doing business, the demand from its target markets, its political and safety stability and so on… However, some of the common issues no matter which destination include (a) information technology – access to it and ability/skills to use it in an optimal way (b) the level of understanding and support by government at all levels, and the way they engage with the industry; and (c) the vision that key industry and government leaders have about sustainable tourism. Let me share an example from Australia. After more than 20 years of the Australian government, peak industry bodies and Universities spending million upon millions of dollars on policies, research, and practices on sustainable tourism, recently an Australian Government Steering Committee called ‘Beyond 2030’ published its vision which is all about the classic neo-liberal boosterism approach to increase numbers and economics. No vision at all about a sustainable vision which considers management of key issues such as environmental and/or cultural social impacts. Zero attention to future proofing and how to be internationally competitive. The prevailing thinking is insular from global trends. Climate change is, of course, an ongoing challenge that has been around for many years now, but it is one that most tourism professionals have chosen to ignore while its impacts are becoming more and more evident. Cape Town, for instance, is a popular tourist destination that I have frequently visited myself. It went through a severe water crisis last year and you see more and more of the beautiful mountains surrounding the city being marred by bush fires. Destinations need to develop long-term strategies to adapt to climate change or else they may risk severe degradation of their natural tourism resources. The other side of the coin is that tourism destinations so far have failed to address climate protection in earnest, particularly the transportation issue. At best, sustainability begins once you have entered your hotel. How tourists get to their destinations and how they move around there, is conspicuously absent from most destination strategies, or it remains a largely unresolved problem, even in destinations with sincere sustainability aspirations. Rural destinations need to develop intelligent solutions to get tourists away from individual automobile traffic. This is, of course, easier for urban destinations, but these often depend on low cost carriers to get tourists to them in the first place. The second big issue is digitization. Now, I am not an expert in this regard, but with the massive emergence of booking platforms and mobile devices, the classical marketing, information, and distribution tasks of DMOs become increasingly obsolete. Or, rather, they need to be radically changed. But this might also be a good thing, opening up more space for actual tourism planning and management of a destination. The third issue is overtourism. With the relentless growth of international tourism over many decades, the social and environmental impacts are becoming more and more visible. Not everywhere, to be sure –many destinations are struggling to attract more tourists – but the most iconic destinations – historic cities and towns, National Parks and coastlines – must find ways to better manage large visitor numbers or even restrict them. Demarketing would be one strategy to do this. Dispersal of visitor flows, both spatially and seasonally, would be another. Or, rather, concentrate visitors in certain areas with the appropriate infrastructure that are less vulnerable to negative ecological or social impacts. Such strategies have already been successfully implemented in some national parks in the past, but this is a new situation and overrun urban areas require innovative solutions that may have not been tested before – including the notion that there may be absolute limits to growth of tourism. More about the destination sustainability panel here – including previous sessions and answers to some of the most pressing issues linked to making tourism more sustainable.